When I joined the Wing Riders almost five years ago, little did I realise that I would be sitting in the hot seat today as the newly elected National President of this wonderful organisation. It is both an honour and a privilege to have been elected as the National President and as such, I can assure you that I have only the best interests of the members and the advancement of the Wing Riders SA, as a whole, at heart. We, as the National Committee, as well as the Chapter Committees, share these ideals and we serve at the pleasure of the members. By the time you read this, the various Chapters will have held their Annual General Meetings, and will also have elected their new Committees for 2018. I can assure you that those office bearers, as well as the members of the National Council, are a dedicated and extremely competent group of people, and we look forward to taking the Wing Riders SA to the next level. On that subject, our heartfelt congratulations to those members who were prepared to step up to the plate, and were elected and are now serving on the various Chapter Committees. 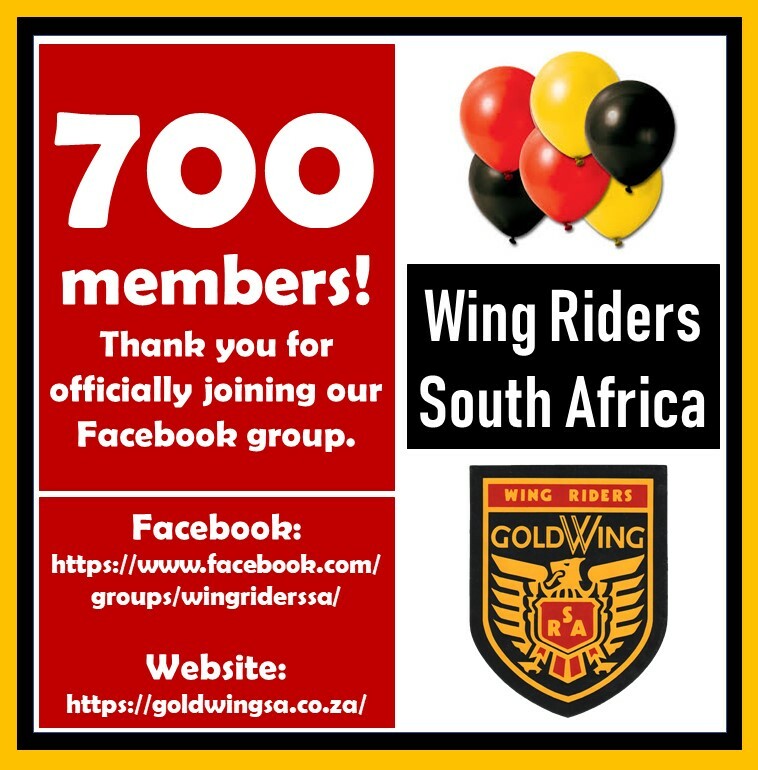 At the end of the day, we simply manage the affairs of the Wing Riders SA on your behalf and we are totally reliant on your honest and constructive input and criticism to ensure we do things right. So please work through your Chapter Committee if you feel that there is something that needs to be addressed. 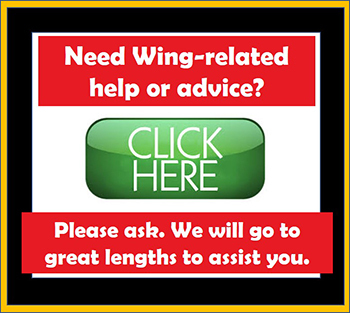 You will also be reading this message on our brand-new website hosted by a new service provider. We realise that the old website was long in the tooth indeed, without knocking the valuable work done by earlier management committees. The new website is a living thing, and therefore very much a work in progress, so we are convinced it is not yet even close to being perfect. 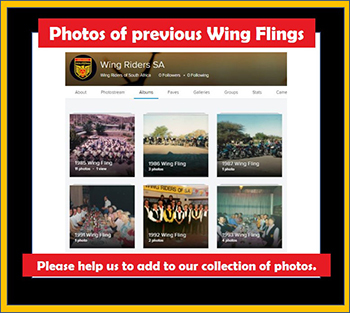 Please work through our website, and feel free to submit comments or concerns to Suzette Grobler (082 925 3514), our National Secretary and Marketing Co-ordinator. It is also that time of year again – Silly Season I suppose some will call it. Whatever it may mean for you, we all deserve a good rest. It is time to put our feet up and relax with our family and friends. If you are going away, please take it easy while on the road – we would like to see every member again early in the new year. We’ve got three weeks and more of holiday ahead of us. It is simply not necessary to arrive at your destination in record time. Just consider yourself as being the only person on the road as being capable of driving or riding, and consider everybody else to be total idiots. It’s called survival. That’s all I have for now. From the National Council of the Wing Riders SA, all that remains is to wish all our members a very blessed Christmas and a prosperous New Year. Like Willie I also need direction/ assistance as I am considering to convert my two wheeler GL 1800 to a trike. Can anybody advise me on this or direct me to people doing conversions. Hi Jannie. Ek stuur vir jou besonderhede per e-pos. Hi Willie. 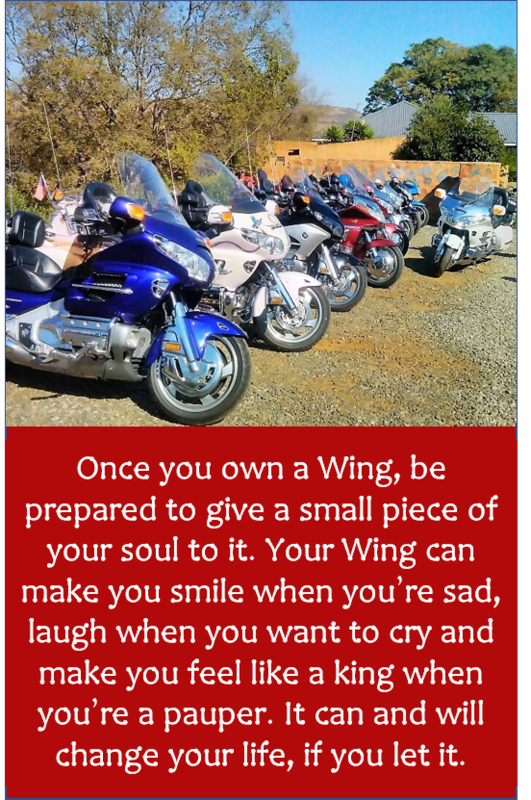 The President of Wing Riders SA would be happy to have a conversation with you. Unfortunately you did not leave your phone number, but if you would give him a call, he would be able to give you his opinion. His name is Luke Hartog and his number is +27 82 573 1385.